The modification of this pattern starts after the 36 round of Charlotte. This example is composed of double-knit yarn and 3 colors have been used, however, you can use any yarn and more colors than 3 if you wish. For free modification details, you have to log in or sign up to Ravelry.com. A link to that pattern on Ravelry.com you will find below. Free pattern of Charlotte – Large Square you will also find below. How to do Charlotte – Large Crochet Square is here. 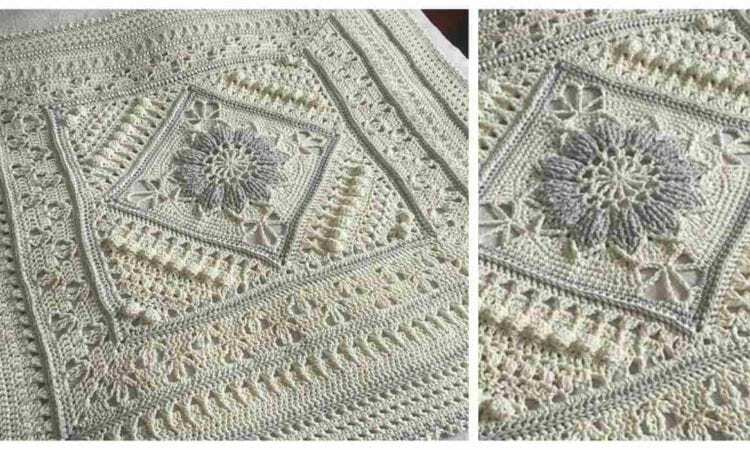 Charlotte’s Sunshine Baby – modification of Large Square – Free Crochet Pattern is here. Don’t forget to Like us on Facebook. For more ideas and free crochet patterns join our Facebook group. Haven’t been able to find the pattern. No link on this site or on Ravelry… Help? How to do Charlotte – Large Crochet Square is here. run into this problem a few times on this site. I love this blanket design and would love to try it out but I cannot find a link to the actual pattern anywhere… help? Love this pattern, but where is the rest of the square? Only 3 parts are given. Thank you. Thank you for posting link to modified large square. Next on my to list. Excited. I’m also having trouble finding the actual pattern. Please help. Have scrolled to the end of the post, cant find it. Please find the sentence ‘Link to the pattern is ‘here” and click on ‘here’. What is the last row. Is it picot? How do you do it? Is there a whole blanket pattern or just a pattern for the square? Beautiful none the less. Can’t find pattern ready to use my IPad for a frisbee . Always have trouble with Pinterest !!! Ready to give up with them again!! Made these squares and used it as a centerpiece for a coverlet for our queen bed. I love how it turned out. This may be the most beautiful Afghan I have ever seen! To whoever made it first, you are a master! Este tipo de croche é muito lindo. Gostaria de saber um pouco mais sobre que fio é mais adequado usar, alguma revista que possa me dar mais instruções para faze. Obrigada.Norma.